Good Morning, Company Girls, Critty Joy Girls, and Caffeinated Randomness Girls! Critty and Michelle have festive themes this week! 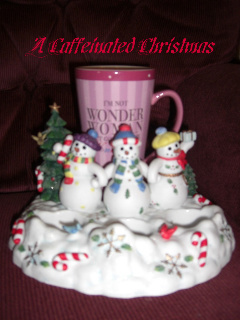 Over at Critty Joy's, we are linking up with our favorite Christmas movies and music. It was our first married Christmas together. We lived in a 600 sq. foot apartment built in who-knows-when and money was TIGHT. Craig worked full-time and I went to school full-time, finishing up my Master's degree in teaching. Oh, and we both commuted about 45 miles one way, in opposite directions. Needless to say, part of the reason money was so tight is because we spent so much of it on gasoline. Anyway, we set a small budget for each other and set out to make our first Christmas memorable. Craig's big present from me was the Bible on CD-ROM and I just thought he would fall all over himself when he opened it. For sure, this would be a big hit. A few days before Christmas, though, I happened to be at Target (dangerous, I tell you) or the grocery store...somewhere...and I saw the movie on the shelf for $9.99. I had already spent all my pennies from the Christmas budget, but I also knew how much my new husband LOVED this movie. I threw it in my cart, went home and wrapped it, thinking it might make him smile. When he opened it, he cried. My brand new husband, speechless and crying happy tears, all because this movie conjured up precious childhood memories. A new mission was formed in that moment. I now try to make him cry every year. Sometimes I have been successful and sometimes not, but I must tell you, the years of the tears have been mostly when we have had very little money. It's interesting what comes to mind when one must be creative in blessing someone and goes to show that the expensive gifts are not the only ones to be deeply treasured. Maybe next week, I'll share the poem I wrote him. It's called "My Daddy's Hands." Today, as I drove to pick Hannah up from school, I was drinking in this song. And, alone in the car, I thought about what it meant to play my drum for Him, my Jesus, Christ the King, the babe in the manger. I cannot play a drum, but I can write. And my every word can be music to His ears if it is for His glory, and His glory alone. That is so sweet about your husband! It really proves that simple is better when it comes to gifts. Your husband has good taste in movies. Ha! 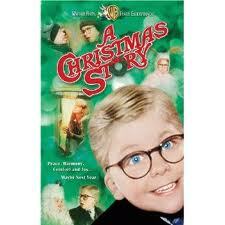 A Christmas Story is my favorite movie too! Thanks for reminding me to watch it again this season! Love that story and yes, times when we use our creativity is memory making in so many ways. We've never seen this movie, so perhaps that should be on our list this holiday season. Wishing you a fun filled, memory making weekend! It is so sweet when a husband's face light up (or tears come streaming) over a gift or gesture from his wife!! Kudos! I've never sat through the whole thing. Maybe I'll find it on T.V. this year and see why its such a beloved Christmas movie! I love finding gifts (or making them) that I know will touch my husband's heart. It's too easy to just give him another tool or something from his list. I like to find gifts that speak to who he is. Awwww! What a beautiful story. I love how strong memories can be some times that one thing, like a movie, can transport you back to another time and place for just a moment. Thanks for joining in the fun today sweet friend. So sweet. The best gifts aren't the ones that costs the most. Dear Jen, This is beautiful...you are right about the having little and how special that makes it all...did you read "How to be the Rich Family at Church?" that Ann Voskamp posted? Isn't it funny how we think one thing will really get to them, and men are totally on a different wave length? Thank you for sharing the story about your husband! I always love hearing stuff like that. I also love what you wrote about The Little Drummer Boy. It's amazing sometimes how a song can hit you when you just listen. When I was coming home the other night I was listening to Mary Did You Know, and even though I've always loved that song, it just really hit me that night. I had to add my own words and sing "Mary did you know that your baby boy would save this ole' girl's soul?" What an amazing Saviour! Lots of smiles to you, and I hope you accomplish the gift tears this year! Ah, Josh Groben is always amazing! LOVE that Josh Grobin link. . .thank you so, so much!!! Isn't it lovely when we have such wonderful Christmas memories...thanks for stopping by Jenn...you'll have to tell us how you made your hubby cry this year! Okay are you trying to make your readers cry too?? It worked :) Love that story!